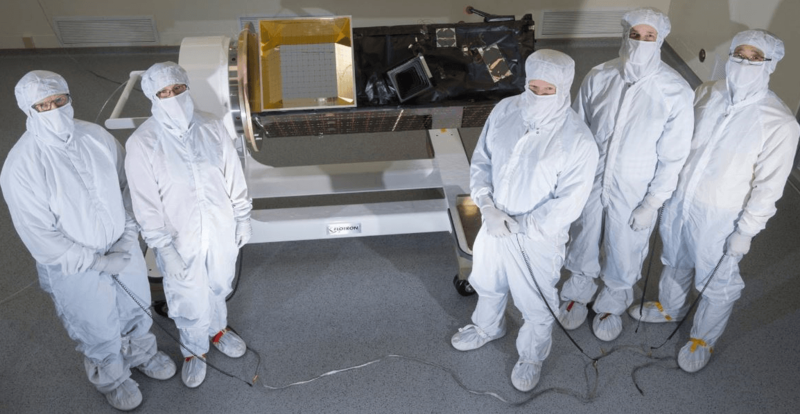 MIT / Lincoln Labs developed, built and prepared for launch the 113 kg, 1.5 meter long ORS-5 SensorSat Space Situational Awareness Small Satellite. A Flotron CTL-36 Small Satellite Cantilevered Rotation Fixture, part of Flotron’s CTL series, provided the MIT/LL team with ergonomic access during Assembly, Integration and Test operations. 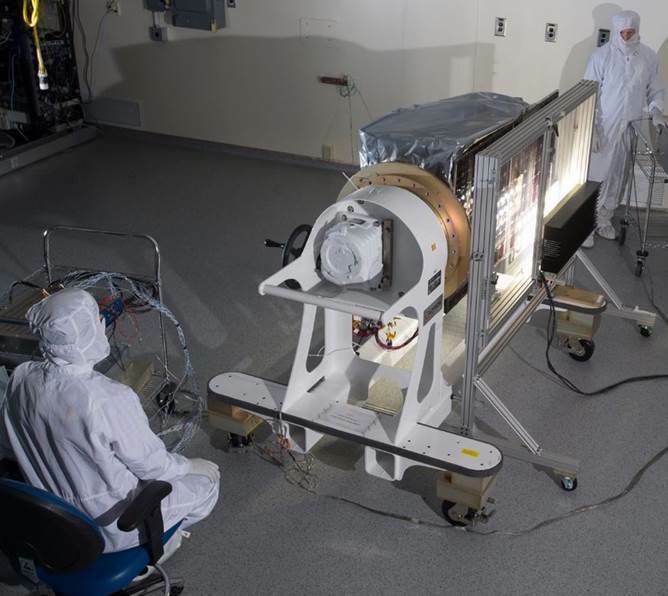 ORS-5 (Sensorsat) is a Low Earth Orbit satellite with optical imaging payload that will monitor potential threats to space assets in the geostationary (GEO) belt. All of the satellite components (minus the optical imaging payload) were attained from commercial spaceflight hardware suppliers to keep cost down. ORS-5 utilizes the GeOST (Geometry Optimized Space Telescope) concept, established at MIT Lincoln Labs. GeOST allows a small detector in low earth orbit to achieve greater imaging sensitivity and discern between celestial objects and resident space objects by pointing the spacecraft’s imager at the GEO Belt at an angle perpendicular to its velocity vector while ensuring that the velocity vectors of both the imager and the space asset are aligned. The Flotron CTL-36 load capacity is 3,000 lbs considering a payload CG located at up to 30” out from the interface mounting plate. Flotron considers a simultaneous dynamic loading condition of 0.5G horizontal (worst case direction) and 1.0G vertical for both stress and stability in addition to SFy = 3 and SFu =5. The rotation axis is 36” above the floor and the swing radius is approximately 27.25”. The gear ratio is 217:1 meaning that 217 turns on the input hand-wheel will result in one 360° rotation of the payload. This system consists of a geared bearing that is secured to the vertical tower. The Easy Crank torque of the gear system is approximately 7,200 in-lbs. “Easy Crank” is a term defined by Flotron and specifies that the input load on the hand-crank is 12 lb or less for ergonomic operation. The standard interface plate is 24”DIAM and has x20 Ø.531 thru holes on a 22” bolt circle. The frame is constructed from carbon steel material. The frame and tow bar are powder coated gloss white and the gearbox is painted gloss white. The steel interface plate is electro-less nickel plated. The caster bodies are finished with satin e-nickel. All of the fasteners/hardware are stainless steel, e-nickel plated or black oxide. The caster swivel bearings are lubricated with Braycote 601EF. A push handle is been integrated in the base frame and located at an ergonomic height for an operator to effectively maneuver the Flotron. The casters have 6”dia phenolic wheels, tread lock brakes & bolt-on swivel locks that allow for safe and ergonomic transport. A storage box has been integrated on the base frame to store customer tools, fasteners … etc.